Being HTTP-only, vCMA doesn’t lend itself to secure computing over the public Internet or untrusted intranet. Instead, it is designed to work with security layer(s) in front of it. While it IS possible to add HTTPS to the Apache/Tomcat server delivering its web application, vCMA is meant to be deployed as-is and updated as-is – it’s an appliance. By default “https” (or SSL certificate) is enabled in the appliance for the vCMA for enhanced security. You can replace the out-of-the-box certificate with your own, if needed. However, http->https redirection is currently not supported. The vCMA server comes with a default userid/password. For security reasons, we strongly recommended that you change root password. If you prefer, you can set a hostname or IP address for the appliance. Using standard Linux utilities, you can change the date and time in the appliance. 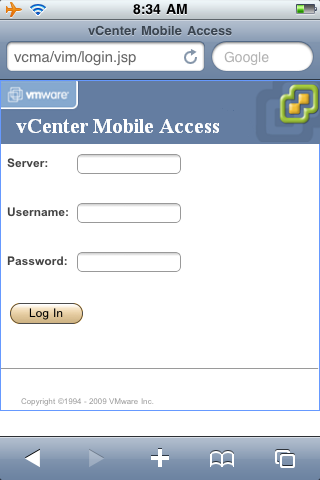 You can also upgrade the hardware version and VMware Tools in the vCMA appliance following standard procedures. SOLORI’s Take: This welcomed change circumvents any additional kludge work necessary to secure the appliance. Using an HTTPS proxy was cumbersome and kludgey in its own right and “hacking” the appliance was tricky and doomed to be reversed by the next appliance update. VMware’s move opens the door for more widespread use vCMA and (hopefully) more interesting applications of its use in the future. Fixes an issue in the VMkernel TCP/IP stack where adding a system to an HA (High Availability) cluster results in a timeout error. Fixes an issue where a virtual machine might fail if a reserved register is accessed within the guest operating system. Fixes an issue where a virtual machine might stop responding or the progress bar in the graphical user interface might appear to be stuck at 95% when you consolidate a snapshot of a powered on virtual machine. Read the rest of this entry ?